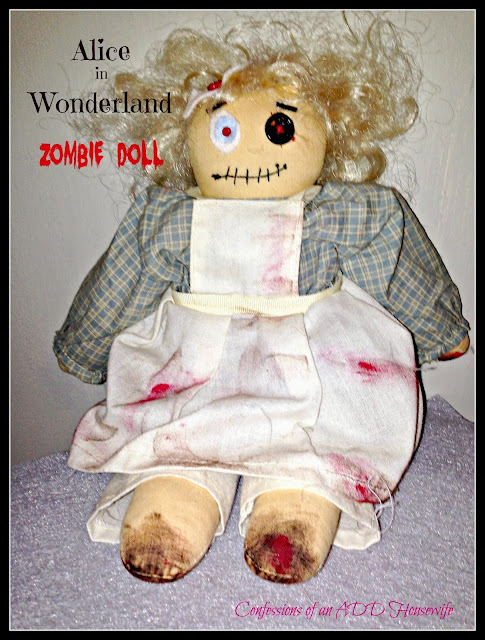 I made an Alice Zombie doll a couple weeks ago. It didn't go like I wanted and there were a few other mishaps with the project that meant I needed to start over. Thank goodness this zombie doll went much better. I think I'm going to stick with using premade doll forms for my zombie hoard. It makes things a lot easier. For Alice part two, I also found a good use for a decapitated Barbie head...by using the hair. It was perfectly out of control! After cutting the hair off the Barbie, I hot glued it to the doll form's head, covering the entire back. Then, it was trimmed up. The eyes were made using a button, felt and a scrapbooking brad. I also added a small felt hair bow with a heart button. And just like any good zombie, she's covered in dirt and blood (stamping ink and paint.) No hands and feet because those have been cut off leaving her with bloody stumps. Too bad she's not staying at my house. 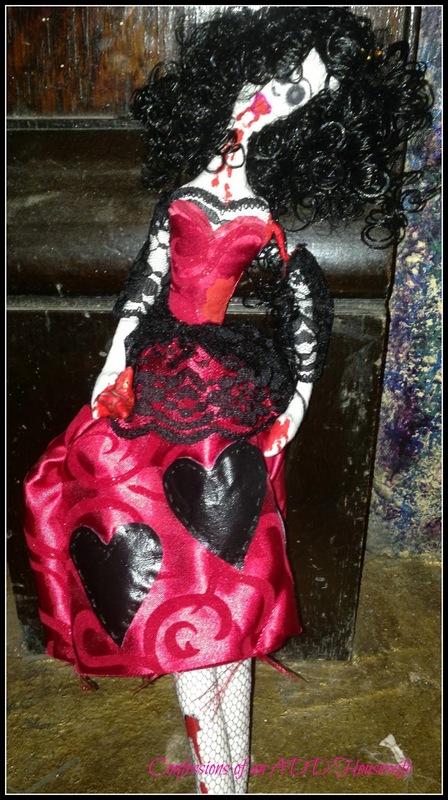 She would have made a nice companion to the awesome zombie Queen of Hearts I received from Sarahrella After Midnight! This is too funny! Almost too adorable to be scary. Thanks for sharing. I am thinking the bald headed Barbie is scarier.